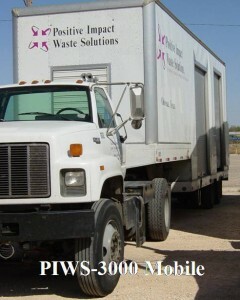 Positive Impact Waste Solutions, LLC (”PIWS”) is a manufacturer of the PIWS-3000 units for the treatment of special waste from healthcare related facilities. 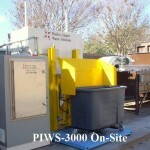 The PIWS-3000 units have been continuosly processing hospital medical waste since 1997. 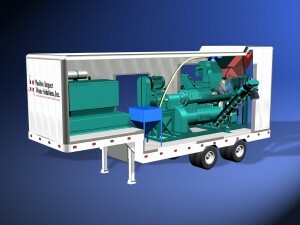 The patented PIWS-3000 Mobile/Fixed units process over 2,000 lbs per hour or over 8.0 million lbs of waste annually. The smaller PIWS-3000 On-Site unit processes over 400 lbs per hour or over 1.0 million lbs per year. The PIWS-3000 uses a proprietary dry chemical Cold-Ster® that is the only dry chemical approved by the EPA for the treatment of regulated medical waste. The PIWS-3000 renders regulated medical waste unrecognizable and landfill-ready via the general waste stream. The patented grinding action employed in the process reduces the waste stream by over 70%. The PIWS-3000 is environmentally friendly and does not produce any air or wastewater emissions or other hazardous by-products. - Flexibility. The PIWS-3000 can be configured as either a mobile or a fixed-site unit. - No Odor. The Cold-Ster® used in the treatment process is a smell inhibitor and as such there is limited odor during processing and no odor after the treated waste is disposed of in the trash receptacle. - Mobile/Onsite. The mobile/onsite capability of the PIWS-3000 and the low cost structure provide RMW generators the one feature they most desire: cost-effective, on-site treatment of RMW in order to reduce their risk of RMW disposal. - High volume. 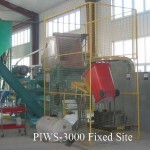 The PIWS-3000 is a continuous feed RMW processor with an average volume of over 2,000 pounds per hour for the large unit and 400 pounds for the smaller On-Site unit. This extremely high throughput is due to patented shredder technology and the proprietary Cold-Ster® dry chemical. - Cost-effective. The cost of the PIWS-3000 combined with the unit’s high volume capability provide users with a low cost structure. - Environmentally friendly. The PIWS-3000 renders RMW unrecognizable and landfill-ready via the general waste stream. The PIWS-3000 unit does not produce any measurable air or wastewater emissions or other hazardous by-product. - “Cradle to Grave” Responsibility. Of major importance to medical waste generators is the “cradle to grave” responsibility factor defined by federal and state regulations. The PIWS-3000 unit can be strategically placed either at a facility’s premises or close by to reduce the risk of this “cradle to grave” responsibility. - Land-fill Ready. 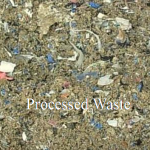 After the regulated medical waste is completely processed with the PIWS-3000 system, the output is completely unuseable and unrecognizable material that is ready for general landfill disposal. The processed material can be mixed with the healthcare facilities other general waste and due to the reduction in volume of over 70%, is great for disposal in the compactor. Designed by Aaron Presley. Powered by Wordpress.